As a music lover, I would like to create my own songs that make use of different instruments. However, I’m not that skilled to use all of them. I know how to play the guitar (intermediate at best) and the piano (basics) but that’s about it. Good thing there are tools out there that aids aspiring musicians to create their own music. One of them is Musicshake, a composer application and social network site for creating and sharing your own music. First, you have to create an account from their main site. You can link this account to your facebook account if you want. Once done, download their composer application and install. Open the application and login with your account. From here you can start making your own songs. When I first joined musicshake, the only way to create music is by using their desktop composer software, but now, they also offer an online version which has a different user interface and more limited features. Before proceeding with the steps, let’s define some terms. 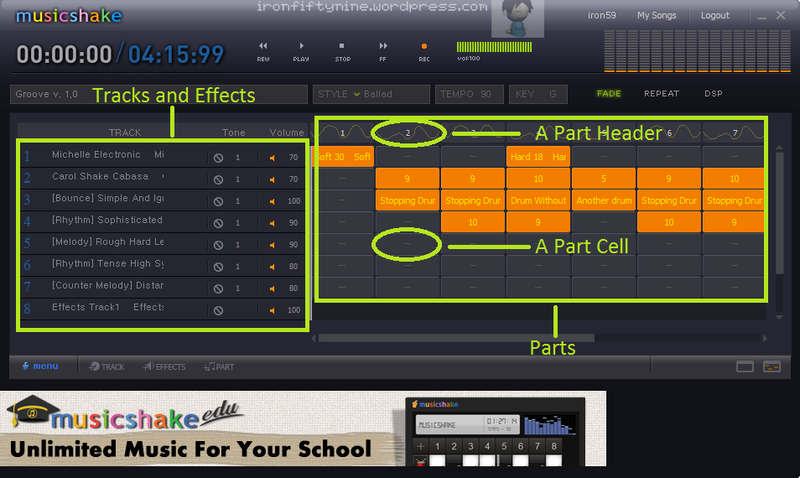 Track – Refers to an instrument or effect track that can be added to your music. Instrument tracks offer a lot of choices ranging from guitar, string pad (violin, cello, etc. ), piano, drums, up to vocals and raps. Each choice is further divided into different groups, with each group containing several choices of play styles. Effects offer sounds from various sources like nature, animal, voice overs, etc. I’ve used this to add dramatic effects or for portraying situations like in an actual music video. Each track also has a volume and effect property. The effect property adds modifications to the sound of a track (e.g. Reverb, Normalize, Higpass, etc.). You can also add a record track where you can use a recording device to add a track of your recorded sound, so if you’re a professional musician, you can use this application for your accompaniment. Part – This represents a single constant measure in your song (A song with 9 parts at tempo 90 will last 3 minutes and 33 seconds which makes each part around 23.6 seconds). Each part has a chord progression attribute which affects the available play sequences (not applicable for effects) for each track that you add to your song. This means that, a track’s play style, chord progression, and play sequence will determine that track’s music output. 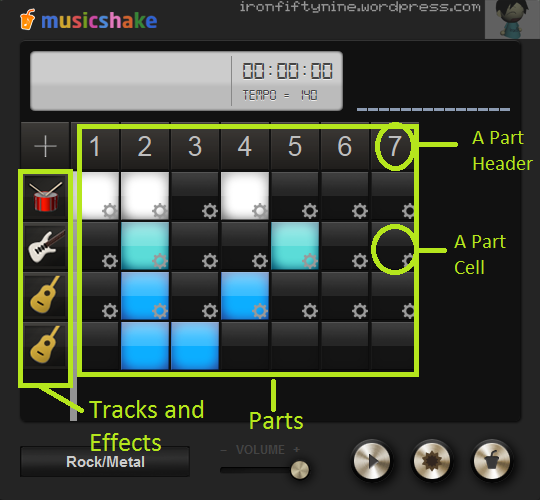 This enables the users to have countless possibilities when they are making their own music. For effects, move the effect bar to the time that you want it to be played. If you need to add more parts, just click Add Part. After uploading your song, you’ll be redirected to your musicshake page. Hover the newly uploaded song and click post to share your song to the community. I recommend using the desktop application version since it’s faster to use and offers more options for customization. The online version goes through a download process each time you add a new track, effect or part which slows down your music making experience. In the desktop application version, you will still need an internet connection to preview the tracks but other than that, you can add your components on the fly. Songs shared online can be rated and marked as favorite by other users. You can also view the most played songs for the last 24 hours. Users also has a fan based system where you can become a fan of another user. Your fan base can be viewed in your profile. There’s also a battle option where you issue a challenge to another user’s song and then choose a song of your own. From there, other users will rate which song is better. The site also includes a forum for any queries and promotions that you would like to make. If you have a lot of accounts from different social networks and online services (like me), then you may find it clunky to logon to various websites, email accounts, and chat applications just to keep you updated with your social circles or message someone from your contacts. This is hard to manage and totally time consuming. Luckily, there are tools that can help you organize these accounts more efficiently. With Digsby, it won’t be necessary to open a web browser or another chat client (Except if your’re using Skype XD). 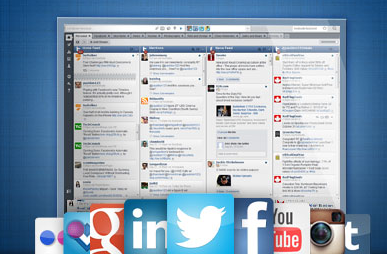 The main application of Hootsuite is web-based, but mobile versions are available for iOS, Android, and Blackberry.